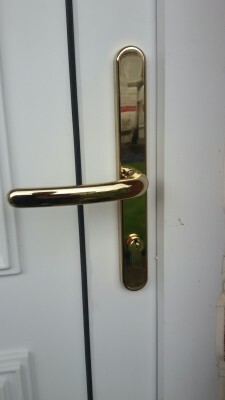 My customer looked high and low on the internet and in local iron mongerers for a new set of handles for his door. The mechanism in the door was an old style Fullex. Good lock in it's day and even today. The gentleman called me to ask for some advice. I arrived at his house and pulled out these beauties. Specialising in UPVC I always carry a selection of handles in a wide variety of centers. I never use budget handles and my stock is always the premium handles. Handles that will not only look good, but feel good and last years and not months. I had to fit the handles to the door as it was not just a case of like for like. To compliment the handles I provided a new lock. Anti snap cylinder that came with 3 keys. My customer needed 4 more keys so I cut and tested the keys to make sure they worked. When installed needless to say my customer was very happy. I save you money. By getting your badly locking door looked at now I could save you the cost and inconvenience of UPVC door repairs at a later date and the cost of a new door. For more information please visit our website A.L.S. door repair service or call 07712445612 and ask for Steve.